The first step is getting everything that's in the garage; OUT of the garage. This leaves you with the big space to thoroughly clean, scrubbing spots that haven't been touched in ages and some you forgot were there. Dust is sure to be an issue in these types of hidden spots, so it's best to come at those problem areas with a damp microfiber cloth/towel. This will get up all those dust bunnies in single swipe rather than brushing them all over and spreading them around with a broom. After the walls comes the floor of the garage. Vacuum in those little nooks and corners and get out any hiding dirty dust balls. Depending on the type of flooring in the garage (most commonly concrete), various cleaning methods can be used. With the more common concrete flooring, a sturdy bristle broom and a cleaning detergent are best. Once the inside of the garage is looking brand new, it's time to tackle everything you just took out of it. This is also the perfect chance to make a couple of extra bucks on some stuff you just had sitting in your garage for x amount of time. Going through all the items you've had stored away could lead to a chance for a potential yard sale or even reselling some things online. Besides making money off old items, it gives you the opportunity to organize all your stowed indeed away belongings. This could lead to uncovering something you forgot you had, something you've been looking for for ages, or maybe just throwing junk away that no one needs or wants anymore! To keep the organization in your garage after the cleanup, it's smart to get ahold of a few helpful items to store away the things you want to keep. Plastic totes are one of the best options because they can save a ton of things, don't take up too much room, and they're stackable! Various shelving units are perfect as well; that way things can be kept in reach when needed but not in the way. 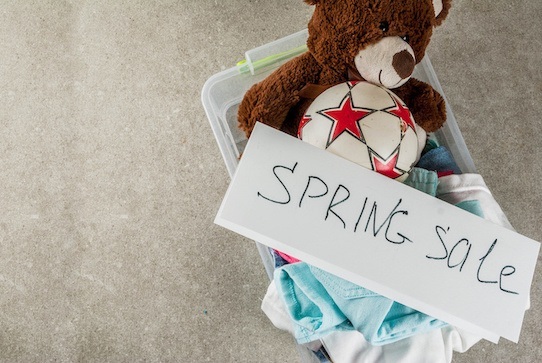 Once you have this marked off on your spring cleaning checklist, you can do so much more with a room that was once just for junk and the occasional parked car. Bring life back into your garage this spring! One way to make your garage an enjoyable space this Spring is by adding a retractable screen from Michele's Hide_Away Screens. Click here for a free quote.